London, United Kingdom: The IYF Secretary-General Ambassador Saeed ZAKI announced today the appointment of Anita Pavic of the Republic of Croatia, as Assistant Secretary-General and Director of the IYF Bureau of Management. “Anita brings a wealth of experience, expertise, and dedication to this hugely important role. I am certain she will make an enduring and positive impact on the IYF’s work around the world.” Said Julia BLOCHER, IYF President. 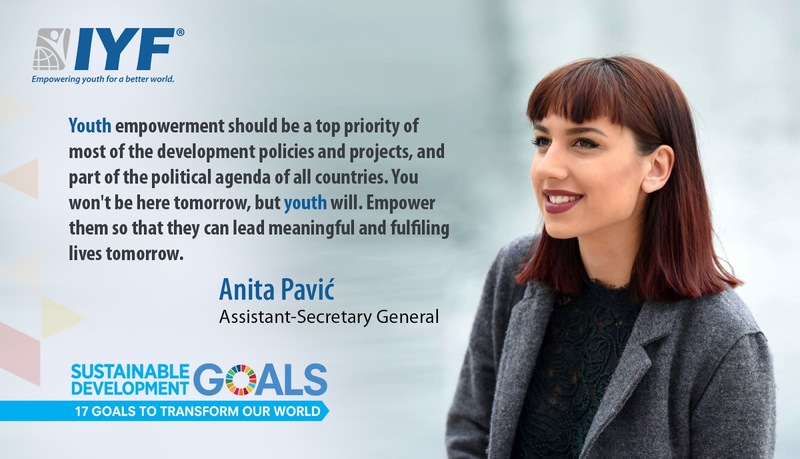 In his comment on the appointment, IYF Secretary-General said: “We are excited to have Ms. Anita in this role as she brings with her incredibly strong knowledge and experience which will be vital as we continue our ambitious plans to continue serving young people and contribute to a sustainable world through youth empowerment." Ms. Anita brings to this position more than a wide range of experience in programme management, advocacy, outreach, and coordinating youth empowerment work. Last year she became Youth Ambassador for Women Against Violence Europe Network and since that she played an important part in the raising awareness about gender-based violence and economic-related abuse. In 2016 she founded Youth Association Ahimsa in Croatia, an organization aims to protect and promote human rights, raising ecological awareness and encouraging youth to actively participate in their communities. Earlier in her career, she served as President for Youth Association Ahimsa in Croatia (2016-2018). She also has researches and interests in refugees issues, development women and youth empowerment. Ms. Anita holds a Bachelor of Arts (French/Russian Language and Literature) from University of Zadar. The International Youth Federation is a global youth network, an organization advocating for youth empowerment and connecting countries to knowledge, experience, and resources to help young people build a better future. For more information, please contact the IYF® Media Relations via e-mail: press@iyfweb.org, or visit our website at www.iyfweb.org.